Muslims surveyed in the Pew Global Attitudes Project favor a prominent – in many cases expanded – role for Islam and religious leaders in the political life of their countries. Yet that opinion does not diminish Muslim support for a system of governance that ensures the same civil liberties and political rights enjoyed by democracies. Yet there is a pervasive belief that the desire for more freedom and openness is not being fulfilled. Among the majority Islamic countries surveyed, just two – Mali and Senegal – were rated as “free” by Freedom House in its most recent report on democracy around the world. This reality is reflected in the bleak assessments many Muslims give of political freedom in their own countries. Perceptions of repression in some predominantly Muslim countries – notably Turkey, Bangladesh and Lebanon – are greater than anywhere else in the developing world. But it is important to note that this survey was conducted before the Turkish general elections of November 2002, when the country‘s unpopular prime minister, Bulent Ecevit, was replaced by Recep Erdogan of the Islamist-based Justice and Development Party. 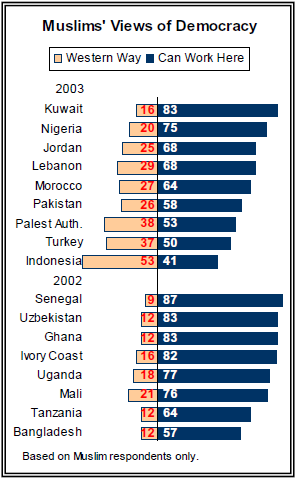 Majorities of Muslims in nine nations favor a large role for Islam in the political life of their countries. This view is common both in countries where Muslims are the overwhelming majority of the population (Pakistan, Jordan, Indonesia, Bangladesh and Mali) as well as where Muslims make up a minority (Uganda, Ivory Coast and Nigeria). In four other nations (Lebanon, Turkey, Senegal and Uzbekistan), opinion is split over whether Islam‘s role in political life should be large or small. Only in Tanzania is there a prevailing sentiment among the Muslim minority that Islam should play a small role in politics, if any. Attitudes on Islam‘s proper position in political life can be understood in the context of how people perceive its current role. For example, most Indonesian Muslims are satisfied with what they see as a high level of Islamic influence in politics. Fully 86% say Islam plays a very or fairly large role in the political life of their country, and 82% think it should play a substantial role. In Pakistan, Uganda, Jordan, and Bangladesh many Muslims want to see Islam play a greater role than they think it currently does. In Pakistan, where Gen. Perez Musharraf‘s hard line against Islamic extremism has provoked a backlash among some Muslims, 56% say Islam plays a large role but far more (86%) think it should play a large role. Moreover, just 35% think Islam currently plays a very large role in their nation‘s political life today, but 75% think it should have a very large role. Senegal, Lebanon, Uzbekistan and Tanzania are at the other end of the spectrum. Solid majorities in all three countries say Islam already plays a prominent role in their country‘s politics, but far fewer believe this should be the case. Nearly two-thirds of Senegalese think Islam plays a major role in politics, while just 42% endorse a significant political role for Islam. The gap is nearly as large in Lebanon and somewhat smaller in Uzbekistan and Tanzania. 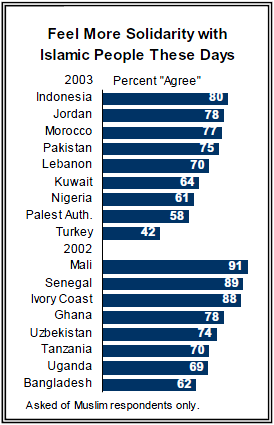 In other parts of the Muslim world there is general satisfaction with Islam‘s political influence. Indonesians are generally satisfied with religion playing a very large role in their nation‘s politics. In Turkey, Mali and Ghana, most are happy with what they see as a more moderate Islamic influence in each nation‘s political life. Larger Role for Religious Leaders? The widespread Muslim support for religion playing a prominent role in political life is also seen in the large number of Muslim respondents who believe religious leaders should be more active in politics directly. Fully nine-in-ten Muslims in Nigeria (91%) and solid majorities in seven other countries endorse religious leaders playing a larger role in politics. In several of the countries – notably Bangladesh, Jordan and Mali – support for religious leaders becoming more active in politics is associated with the view that Islam should have a bigger role in political life. In other countries, the pattern is reversed: Muslims in Tanzania, Senegal and Uzbekistan, who have more reservations about a strong role for Islam in politics, oppose a greater political role for religious leaders. But there are some interesting contrasts in these views in other nations, suggesting that the idea of religious leaders becoming more politically active is more appealing than Islam having a greater role in politics. In Lebanon, for example, 72% of Muslims feel that religious leaders should play a larger role in politics than they currently do, even though a plurality wants Islam to play less of a role in political life than it currently does. Similarly, 91% of Nigerian Muslims favor more political participation by religious leaders even though just 61% favor a large role for Islam in politics generally. In some other countries, it is the direct participation of religious leaders in politics that is more troubling to Muslims. For example, Pakistanis feel more favorably toward Islam playing a general role in political life (86% favor) than they do about religious leaders taking part in politics (63% favor). Muslim attitudes on the proper role of religion in politics and public life are, for the most part, unrelated to people‘s own religious commitment. Muslims who pray regularly, fast on Ramadan, and say religion plays an important role in their lives are no more or less likely to support a greater role for Islam in politics than those who are less religiously oriented. This suggests that support for religious leaders becoming more deeply involved in politics does not necessarily imply support for a more religiously oriented state or that the belief that religion should play a role in public life means believing that everyone must be religiously devout themselves. Support for a religious role in political life among Muslim publics does not necessarily carry the same implications that it might in a nation like the United States, where the separation of church and state has been codified and reinforced over the years. Most importantly, while many Muslims around the world would like to see more religion in politics, this view does not contradict widespread support for democratic ideals among these publics. In fact, in a number of countries, Muslims who support a greater role for Islam in politics place the highest regard on freedom of speech, freedom of the press and the importance of free and contested elections. Muslim respondents are optimists about democracy. Relatively few Muslims agree that democracy is a “Western way of doing things that would not work here.” Instead, majorities in most predominantly Muslim nations believe democracy is not just for the West and can work in their country. Reservations about western-style democracy are greatest in Indonesia (53%) Turkey (37%) and the Palestinian Authority (37%). This represents significantly less support for democracy in Indonesia than in 2002, when 64% of Muslims thought a western model of democracy would work in their country and just 25% did not. Majorities in most predominantly Muslim countries place a high priority on having the freedom to criticize the government. Support for this right is particularly prevalent among Muslims in Turkey (83% very important), Mali (80%), Bangladesh (79%), as well as in Nigeria (72%), Senegal (71%) and Lebanon (66%). Similarly, majorities in most predominantly Muslim counties believe multi-party electoral systems and judicial systems that treat everyone the same are very important. Freedom of the press to report on the government without censorship is also highly valued. But Muslims in several countries view these freedoms as less important. In Pakistan, Indonesia, Uzbekistan and Jordan, fewer than half of Muslims surveyed rate honest two-party elections and freedom of the press as very important, though most view these freedoms as somewhat important. In Jordan, a monarchy with a limited parliament, there is a notable lack of enthusiasm for such liberties, owing at least partly to divisions between Palestinians living in Jordan, who tend to be more supportive of democratic freedoms, and native Jordanians. Roughly a third of Palestinian Muslims (33%) give a high priority to honest elections, compared with 19% of Jordanians. Religious freedom also is highly valued by Muslim publics. Muslims in Senegal are nearly unanimous in their support for religious freedom (97%), and more than eight-in-ten in Lebanon (85%), Turkey (84%) and other nations agree. In religiously diverse nations, such as Lebanon and Nigeria, Muslims are as supportive as non-Muslims of the right to practice religion freely. The lone exception to this pattern is Jordan, where just four-in-ten say it is very important that people can practice their religion freely. Three-in-ten Muslim respondents in Jordan rate freedom of religion as relatively unimportant – the highest proportion among all nations surveyed. Again, Palestinians are more likely to value religious freedom than other Jordanians, with 45% saying it is very important (compared with 32% of Jordanians). Expressions of support for the democratic ideals of competition and freedom of expression do not conflict with opinion in favor of a role for Islam in public life and politics. In most countries, supporters of an active role for Islam are no more or less committed to these democratic ideals, and in a few predominantly Muslim nations, notably Bangladesh and Pakistan, those who are most supportive of a role for Islam in public life and politics are also the most supportive of freedom of speech and electoral competition. Despite the broad support for a greater political role for Islam, Muslim publics are generally no less supportive of keeping religion separate from government policy than are people in other countries. In countries with more secular traditions, such as Turkey, Senegal and Mali, roughly seven-in-ten completely agree that religion is a matter of personal faith and should be kept separate from government policy. Indeed, publics in those three countries are even more supportive than Americans of keeping religion separate from government policy. Just over half of U.S. respondents (55%) completely agree that religion is a matter of personal faith, not government policy, compared with 73% of Muslims in Turkey, 71% in Mali and 67% in Senegal. In religiously diverse countries, Muslims generally favor keeping religion a private matter at the same rates as non-Muslims. In Nigeria, for example, six-in-ten Muslims and the same proportion of non-Muslims completely agree that religion should be kept separate from government policy. In Lebanon, there are only modest differences on this point between Muslims and non-Muslims (59% non-Muslim completely agree; 53% Muslim). But Muslims in Jordan and Pakistan are decidedly less supportive of keeping religion and government policy separate. 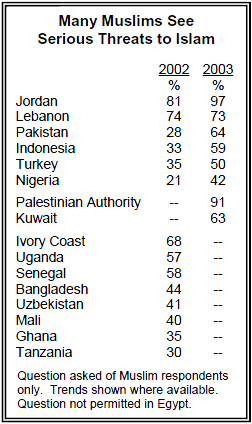 Just a quarter of Muslims in Jordan and only about a third in Pakistan (34%) completely agree with the principle of maintaining a clear division between religion and policy – the lowest percentages among the 43 nations where this question was asked. Jordan is the only country in which a significant number of Muslims (46%) disagree with the idea of keeping religion and government policy separate. Despite the widespread support for democratic ideals in most predominantly Muslim countries, the survey finds considerable discontent with political rights and civil liberties as they now exist. Majorities of Muslims in Lebanon, Turkey and Jordan say that they do not have honest elections and lack the freedom to openly criticize the government. These perceptions are also widespread in Nigeria, Uzbekistan, Indonesia and Bangladesh. Many also complain that the judicial system does not treat everyone the same and that news organizations face government censorship. While these observations are not isolated to the nations listed above – many Latin American publics say their countries fail to live up to these ideals, and Kenyans also say their country lacks many of these basic freedoms – a pattern of support for democratic principles combined with a perception that their nation currently is lacking in these areas is characteristic of many Muslim nations. Of the Muslim nations surveyed, Mali, Senegal, and Pakistan stand out as the exceptions. Publics in these nations are generally satisfied with the electoral process and rights allowed to journalists and protestors. Most Muslims surveyed – especially those in African countries – feel they have freedom to practice their religion. Nine-in-ten Muslims in Senegal and roughly three-quarters in Mali and Tanzania believe the statement “you can practice your religion” describes their country very well. In Nigeria, far fewer Muslims (51%) say that statement describes their country very well, but seven-in-ten believe they have at least some freedom to practice their faith. And there are only slight differences between Muslims in Nigeria and non-Muslims (56%). 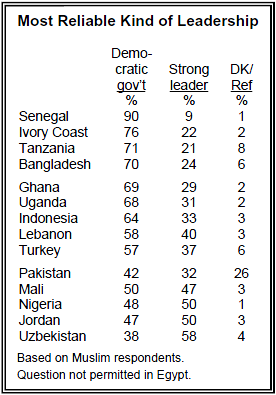 Muslim publics clearly favor democratic government over a strong autocratic leader. In general, there is greater support for a democratic government in the Muslim countries surveyed than there is in much of Eastern Europe. The clear exceptions are Jordan and Uzbekistan, two countries with very strong leaders, and Nigeria. In that regard, the preference of Muslims in Uzbekistan for a strong leader fits the pattern of publics in the former Soviet Union. Nearly six-in-ten Muslim respondents in Uzbekistan (58%) favor a strong leader over a democratic government, which is consistent with results in Russia and Ukraine, where two-thirds believe their nations should rely on a leader with a strong hand to solve their nation’s problems. In Jordan, a monarchy with limited parliament, Muslims are divided, with half favoring a strong leader. Muslims surveyed in the Global Attitudes Project have complex attitudes toward the role of Islam in daily life. These tensions are apparent in attitudes about the role of women in society. Most Muslims express at least some support for a woman‘s right to work outside the home. But majorities in only six of 14 nations in which the question was asked completely agree that women should be permitted to work outside the home. In Pakistan, just a third completely agree that women should be free to work outside the home, and in Indonesia and Jordan even fewer strongly favor women working outside the home. In Jordan and Pakistan, nearly four-in-ten Muslims (38%, 36%) say they oppose women holding jobs outside the home. These views are consistent with the strong sentiment in those two countries in favor of a traditional division of roles regarding work and marriage, with husbands holding a job and the wives maintaining the household. Roughly six-in-ten respondents in both of these countries believe husbands should work and wives should stay home, among the highest measures of surveyed nations. In four of the nations surveyed – Uzbekistan, Mali, Ivory Coast and Nigeria – more than a third of Muslims completely agree that there should be restrictions on men and women working in the same place. In Uzbekistan, where 70% strongly support a women‘s right to work, nearly half of Muslim respondents strongly favor separating men and women at work (45% completely agree). And substantial minorities in Mali (38%), Ivory Coast (36%) and Nigeria (36%) completely agree that separating men and women at work is appropriate. In several countries, there is a significant gender gap among Muslims over whether women should be permitted to work outside the home. In Bangladesh, nearly six-in-ten women (57%) completely agree that they should be allowed to work, compared with 36% of men. The gap is nearly as wide in Pakistan, where 41% of women strongly agree with that statement, compared with roughly a quarter of men (24%). Even in countries where Muslims broadly support women‘s right to work outside the home, like Lebanon and Turkey, differences between men and women are sizable. Indonesia and Jordan are notable exceptions to this pattern. In those countries, support for women working is equally weak among members of both sexes. Just 24% of Muslim women in Indonesia, and 20% of men, strongly agree that women should work outside the home, and support is even lower in Jordan (16%, 13%). There is less of a gender gap over restrictions against men and women being employed in the same workplace. In most cases, women are as supportive of these restrictions as are men. While women in Bangladesh are much more likely than men to strongly favor the right of women to hold jobs, they also are more supportive of separating men and women in the workplace. More than a third of Muslim women in Bangladesh (36%) completely agree such restrictions are appropriate, compared with 20% of Muslim men. Wearing Veils: Who Should Decide? Generally, Muslims believe it should be up to women to decide whether or not to wear veils. Majorities of Muslims in 11 of 14 countries support the right of women to decide whether or not to wear veils, and this is the overwhelming opinion in Turkey, Lebanon, Indonesia and several other nations. The issue of whether women should have the choice to wear veils or not is a sensitive one in many Muslim countries. In recent years, secular governments in Turkey have enforced laws prohibiting the wearing of veils, but nine-in-ten Muslims surveyed in that country (91%) say it should be for women to decide whether they wear veils or not. In Indonesia, by contrast, there have been efforts in at least one province to require women to wear veils. But by six-to-one (86%-14%), Muslims in that country believe it should be up to women to decide whether or not to wear veils. Support for leaving it to women to decide whether to wear veils is even stronger in Lebanon, where women have long had the freedom to determine the practice for themselves. Opinion is much more evenly divided among Muslims in Pakistan and Nigeria. Only a slim majority of Muslims in Pakistan (52%) believe women should be allowed to decide whether or not to wear veils. Fewer than half of respondents in Nigeria (45%) believe women should have that choice. As is the case with opinion on women working outside the home, gender is a factor in Muslims‘ attitudes on veils. In Pakistan, more than six-in-ten women believe they should have the right to decide whether to wear veils; barely four-in-ten men (41%) agree. In Bangladesh, 57% of women completely agree that they should control decisions on wearing veils, compared with only about half as many men (30%). Muslims are divided over whether schools should focus more on ”practical‘ subjects at the expense of religious instruction. Half or more of respondents in seven Muslim nations support giving greater emphasis to practical education, including 63% in Turkey. Yet publics in several other nations – notably Indonesia, Jordan and Pakistan – strongly dissent from this idea. The dominant opinion in those three countries – as well as in Senegal and Nigeria – appears to be driven at least in part by dissatisfaction with the public education systems. This is particularly the case in Indonesia, where Muslim schools have increasingly filled a void left by the nation‘s poor public school system. Nine-in-ten Muslims in Indonesia are opposed to focusing more on practical subjects and less on religious education – and two-thirds completely reject the idea. In Turkey and several other countries, by comparison, there is significantly more support for focusing on more practical subjects. This sentiment is particularly prevalent among Turkish respondents with a low level of personal religious commitment: 82% of this group favors placing greater emphasis on practical subjects, compared with 41% of highly observant Muslims in Turkey. For the most part, Muslim publics believe there is only one true interpretation of Islam‘s teachings. Majorities of Muslims, in 10 of the 12 nations in which this question was asked, reject the idea that Islam should tolerate diverse interpretations of its teachings. Muslims in Senegal are most likely to express the view that there is only a single true approach to Islamic teachings (82%). But even in secular Turkey, Muslims subscribe to this sentiment by more than three-to-one (67%-20%). Indonesia, where Muslims have long accepted diverse interpretations of Islam, is the only country in which a majority (54%) supports that approach. The other nations in which a significant share of Muslims believes Islam should tolerate diverse interpretations are Mali (48%) and Ivory Coast (47%). This question is not a measure of Islamic fundamentalism or tolerance toward other religions and faiths. It also is important to note that this question was not permitted in Egypt and was deemed too sensitive to ask in Jordan and Lebanon. Nearly four-in-ten respondents in Pakistan (37%) declined to express an opinion. Among those who did, twice as many favored a single interpretation of Islam than diverse interpretations of the religion‘s precepts (43% vs. 20%). The perception that Islam faces serious threats is widespread, and growing, among Muslims in many parts of the world. More than nine-in-ten Jordanian and Palestinian Muslims say their religion is threatened, and three-quarters in Lebanon agree. While this view is somewhat less universal in Pakistan, Indonesia, Turkey and Nigeria, the proportion concerned about threats to their religion has risen significantly in all three nations. However, polling in 2002 found that these concerns were not all about external political, military or cultural threats. At that time, references to U.S. foreign policy, America‘s support for Israel, and the general oppression of Muslims by others were common, especially in Lebanon and Jordan. But in most places just as many Muslims referred to problems such as government interference in religion, lack of Islamic unity, disagreements between Muslims regarding issues of religious practice, and references to religious education and moral corruption. The 2003 poll, taken after the Iraq war, did not explore whether the source of the threats was perceived as internal or external. Muslims in nearly all of the countries surveyed say they feel more solidarity these days with Islamic people living elsewhere. This feeling is as widespread among Muslims in Africa and Asia as it is within the Middle East/Conflict Area. Moreover, in nations in which the question was asked both in 2002 and 2003, there was no significant increase in this view. Turkey is the only country where Muslims are divided over whether they feel any greater sense of solidarity.